Monarch butterflies move to the northern range of their breeding territory in the northern United States and Canada from late May through July. One of the most exciting places to see monarchs in the fall is Point Pelee National Park in Ontario, Canada. 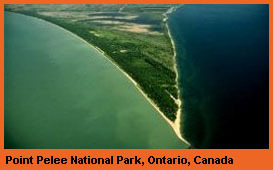 Point Pelee National Park is a particularly important location for monarchs in the fall. The Great Lakes are a significant barrier to the monarchs' southern migration. As they move south, they search for shorter ways across the lake and the Pelee peninsula provides an excellent start! Point Pelee's shape funnels the monarchs to the tip. If the weather is cold, they will roost in trees and wait for warmer temperatures and favorable winds to cross the lake. If the weather is warm, they will often go directly across the lake without stopping in the park. Because monarchs breed only where milkweed is found, their summer range is limited in the north to areas where milkweed grows. Milkweed is abundant and widespread in Ontario thus allowing monarch populations to greatly expand each summer. All milkweed plants contain poisons known as cardiac glycosides. Monarch larvae are not affected by the poisons, but store them in their bodies and pass them on to the adults. Most birds that attempt to eat adults or larvae vomit and learn to associate this unpleasant experience with the bright patterns of the adults and larvae and thus soon learn to avoid them. All milkweed plants contain poisons known as cardiac glycosides. Monarch larvae are not affected by the poisons, but store them in their bodies and pass them on to the adults. Most birds that attempt to eat adults or larvae vomit and learn to associate this unpleasant experience with the bright patterns of the adults and larvae and thus soon learn to avoid them. In Canada, monarchs are listed as a species of special concern and protected under Canada’s federal Species at Risk Act. More information about the status of the monarch and efforts at protection in Canada is available at the Environment Canada Species at Risk website.